DEAN and Shay have identified themselves as the team to beat after winning a second straight room reveal on The Block tonight. 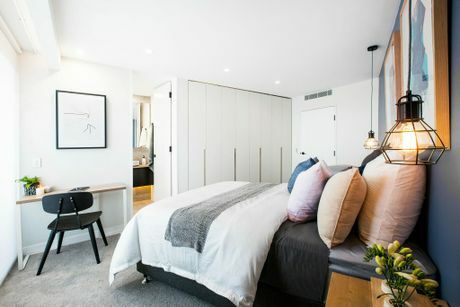 Meanwhile renovation and styling newbies Andrew and Whitney continued to struggle with their mishmash of styles while interior designer Ebony shed a tear when she and brother Luke finished last again. It was a dramatic week of renovations for the five teams, culminating in an evacuation of the work site. Sixteen hours out from room delivery an excavator hit a pipe, causing a large gas leak. "It's really scary. You can see gas rushing out of that pipe at the moment," site foreman Keith Schleiger said. The leak put all of the teams behind schedule and threatened Suzi and Vonni's expensive glass feature wall. With the crane also out of action, Schleiger had to come up with an alternative to get the teams' bedroom furniture on to their floors. As host Scott Cam reminded everyone, the show's room reveals "wait for no one". Dean and Shay won the second week in a row, firming up as the competition's front runners along with Kingi and Caro, who finished second again. 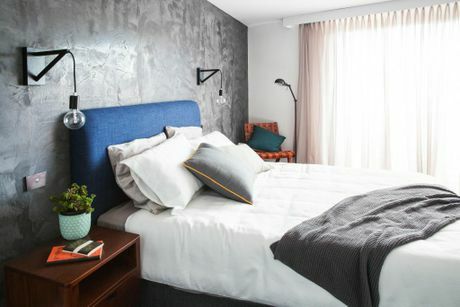 The Newcastle couple were praised for their fresh colour palette and thoughtful styling in the guest bedroom and en-suite. 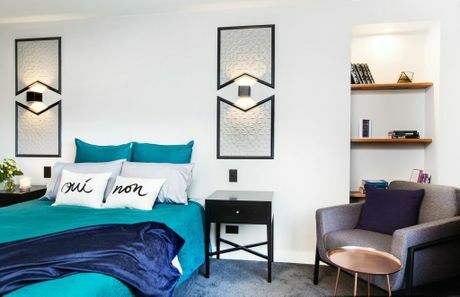 Dean and Shay's winning guest bedroom and en-suite. "Their attention to detail is incredible," judge Shaynna Blaze said. "It says that these guys should have got the penthouse." Runners up Kingi and Caro once again impressed with a vinyl wrap, this time featuring a black-and-white photo of a tram on the door to their en-suite. 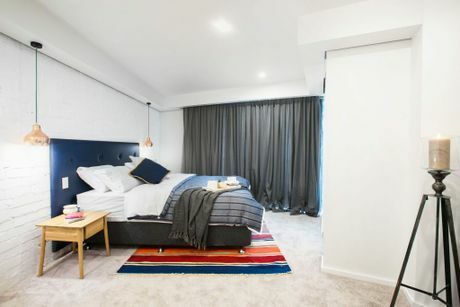 Kingi and Caro's guest bedroom with rendered feature wall. "You can really see the vibe they're going for. It's clearly edgy, urban and a little bit industrial," judge Darren Palmer said. "There's colour, texture; it's not cold at all." Gold Coast mums Suzi and Vonni divided the judges with the impact of their seven-panel glass feature wall. "It's just overwhelming; I'm all for a big idea but this is a huge idea and it's just too much," Neale Whitaker said. Suzi and Vonni's guest bedroom with glass feature wall. "I really like it," he said. "I like all of it. I think it's cool… the colours in here really hype me up." 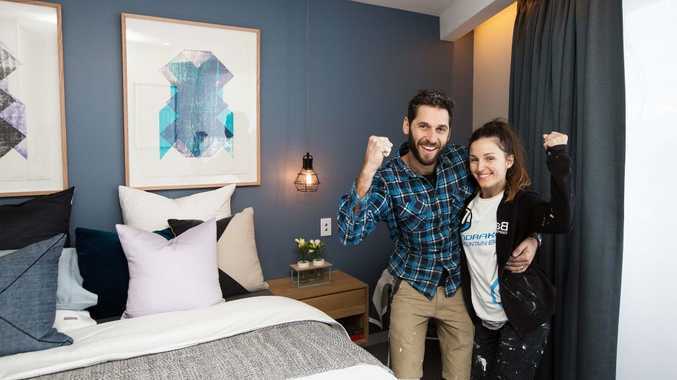 Andrew and Whitney couldn't maintain the standard of their bathroom from last week and were slammed by the judges for not including a wardrobe in their guest bedroom. "For them to put this (branch with hangers) in the second bedroom is absolutely ludicrous," Blaze said. Andrew and Whitney's guest bedroom. "To me it's like they've almost gone back to the confusion of the first week. There's nothing that gels." But it was interior designer Ebony who was brought to tears by the judges' feedback. 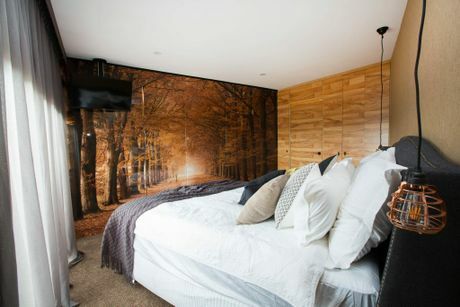 She and brother Luke were criticised on nearly every front, from the planning of their guest bedroom's layout to their styling and tiles in the en-suite. Luke and Ebony's guest bedroom. "This is the first room we've been in today that really emphasises the unusual configuration," Whitaker said. "It just has no life, no energy. It's not a room I want to be in; it's not a room I want to sleep in particularly. "It feels really unfinished and cold." This upcoming week the teams will renovate their master bedrooms.